The EU leaves to member states the possibility of a ban on the state level and acts vary from case to case. Some countries have introduced a complete ban on breeding of animals for fur, generally written in the law for all animals; some have individually over time forbade the breeding of certain species and / or have bans in individual regions, and in some the breeding is limited or totally disabled by the sequence of strict regulations on breeding animals for fur. To ease a review, the information on individual countries are grouped according to the similarity of the adopted acts. United Kingdom - the first European country that adopted the ban on ethical grounds, although it had an annual production of nearly 1.3 million of Canadian mink. The ban was first adopted in England and Wales in 2000, and entered into force in 2003. In Scotland the ban came into force in 2001. In Northern Ireland the ban was adopted in 2002. Austria – the breeding of animals for fur has been banned since 2004, and entered into force in 2005. Macedonia - the act that came int force in October 2014 banned the breeding of animals for fur, skin or feathers. Slovenia – in 2013, 95% of the members of the Slovenian parliament passed by vote a ban on breeding of animals for fur, skin or feathers, with a transitional period of two years. In Slovenia the ban came into force on January 1, 2015 and it includes a ban on breeding and hunting of animals for their fur, skin or feathers. Croatia - the ban was adopted in 2007 as a part of the Animal Protection Act with the foreseen transitional period of 10 years. It should enter fully into force on January 1, 2017. Bosnia and Herzegovina - the ban on breeding of animals for fur was adopted in 2009, and it comes fully into force in 2018. Serbia - the ban on keeping, breeding, import, export and killing of animals for the production of fur and leather, has been passed by the Animal Welfare Act in 2009, and shall come fully into force on January 1, 2019. The Netherlands – banned the breeding of foxes for their fur in 1995. The breeding of chinchillas for fur was banned in the Netherlands in 1997, also due to the inability to achieve adequate conditions for the welfare of farm animals, but both bans came into force in 2008. The member of the Dutch Parliament (the States General) Krista van Velzen tabled on October 4, 2006 a proposal of an act to prohibit the breeding of animals for fur. The act is based on an ethical idea of inadmissibility of keeping fur-bearing animals and their killing exclusively for the production of fur. On January 15, 2013 an act prohibiting the breeding of animals for fur came into force. The act included a transitional period of 11 years (until January 1, 2024) in order to compensate the mink breeders for the financial damage caused by the ban and to facilitate their return on investment. The act, moreover, contains supporting measures that offer compensation for financial losses due to the costs of closure, re-investing or different impact on pension plans. The Dutch association of breeders of animals for fur has filed a complaint against the adopted act, ie. they sued the Netherlands alleging it illegal because they have not received a compensation. The District Court ruled in their favor on May 21, 2014. The Netherlands loged an appeal based on which The Hague Court of Appeal, in November 2015, annulled the decision of the District Court and confirmed the existing ban, pointing out that the new act takes adequately into consideration the interests of breeders of animals for fur because of a transitional period of 11 years and that the supporting measures of the act should be considered as a form of compensation. This way an ethical attitude of the public is clearly pointed out as more important than the economical aspect. Denmark - banned the breeding of foxes for fur in 2009 with a transitional period of 15 years. Belgium – the bans were adopted in the Walloon region and in Brussels in 2015, and they await the decision of the The Minister-President of Flanders to pass a ban for the remaining regions of the country. Germany - fur farms are banned in the German states of Bavaria, Hesse, North Rhine-Westphalia and Schleswig-Holstein. In 2009 Germany adopted new rules regarding breeding of animals for fur, which require increasing the space in cages for the animals. In 2012, the last fur farm for breeding chinchillas Germany was closed due to new regulations on the conditions for accommodation of animals. In 2016 the Regulation for fur farming will come into force, which will require the pool with water for swimming for Canadian minks, increasing the minimum dimensions of cages, the area where foxes and raccoons can dig and other specific requirements for each type of animal, including for chinchillas. It is expected that these stricter regulations will lead to the closure of fur farms in Germany and to a full prohibiotion. In addition, the Bundesrat (the representative body of 16 federal states of Germany, which participate in the legislative process) introduced during the 2015 legislative proposal for a ban on breeding of animals for fur. The proposal was supported by the German Government, and is currently awaiting the decision of the Bundestag. Sweden - ended breeding of foxes for fur in 1995, through amendments to its Protocol on protection and welfare of animals, which urges keeping foxes in a way that allows their natural behavior such as digging and socialization with other foxes. This legislative change was economically unsustainable and all the swedish fox farms are closed until 2000, even though the breeders could adjust to more strict requirements by 2010. The Swedish Government ordered in 2000 from the Swedish Board of Agriculture the evaluation of keeping of chinchillas. In its report, the Committee on Agriculture found that breeders of chinchillas does not comply with the requirements of the Standing Committee of the European Convention for the Protection of Animals kept for Farming Purposes of 1999, regarding the dimensions and the equipment in cages, bedding, nesting boxes and activity options. 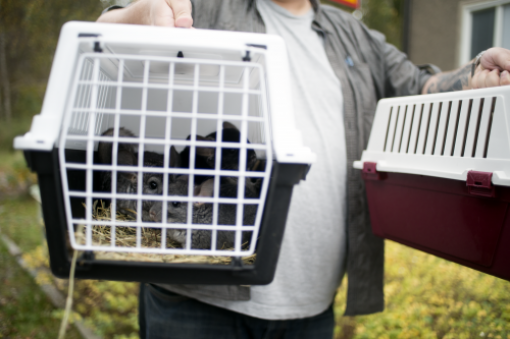 The inspection controls for animal welfare and veterinarians in recent years have shown that chinchillas on the swedish farms live in very poor conditions. Among the biggest problems are: poor air quality, lack of active life, lack of food, stereotyped behavior and chinchillas that were required to wear a polygamous necklaces around their necks up to nine years in a row. Stricter regulations from 2012, which entered into force in 2014, led to the closure of the last chinchilla farms in October 2014. Switzerland - although there is no formal ban on breeding animals for fur, such animals are considered to be wild animals and because of the strict regulations for keeping them there is no breeding. Besides these countries, in some parts of other countries there are ongoing discussions on the ban. Outside of Europe, breeding is prohibited as well in the brazilian state of São Paulo. In November 2014 an act was passed that prohibits the breeding of animals for fur in São Paulo, although after Argentina, Brazil is one of the largest exporters of chinchilla fur in the world. (5) The provision from Article 4 of the Act on the prohibition of breeding of animals for fur production will come into force in 2018. Cleansed text of the Animal Protection Act: The Animal Protection Act (OG 135/06), the Act on Amendments to the Animal Protection Act (OG 37/13), the Act on the implementation of the EU Regulation on the Protection of Animals (OG 125/13). (1) It is forbidden to kill animals, hurt them, make them suffer and injure them, and intentionally expose them to fear, contrary to the provisions of this Act. This Act shall enter into force on 1 January 2007, except / ... / Article 4, paragraph 2, item 23 of this Act which shall enter into force on 1 January 2017. The original of the Act (in Macedonian): http://www.fva.gov.mk/images/2014_149.pdf. 37) keep, reproduct, import, export and killing animals solely for the production of fur and skin. 2) nutrition, ie. food, leather, fur, and other commercial purposes. The Act comes into force eight days after its publication in the "Official Gazette of the Republic of Serbia", except for the provisions of Article 7, Paragraph 1, Item 37) of this Act that will be applicable as of 1 January 2019.